The Mother's Fragrance incense sticks are hand rolled according to the age-old masala method from the finest nature friendly ingredients including sandalwood and other scented wood powders, fragrant leaves, bark, root and gum resins, floral and other essential oils. The Nag Champa line is based upon traditional Indian incense recipes and are therefore stronger than the original line. Each fragrance has honey and a resin called Mattipaal (Halmaddi) as it base. 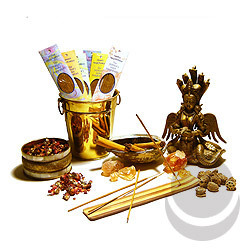 The Mother's Fragrances Incense Sticks are some of the finest incense available in stick for on the market today.